On busy days, trombonist Marc Francis, 26, goes from gig to gig, playing his horn with different bands at a series of different venues—the convention center, a street parade, a nightclub. Sometimes Francis would like to be able to make a quick stop at his apartment to change clothes between gigs. And at 3 a.m., when his New Breed Brass Band finishes its Wednesday-night gig on the Frenchmen Street strip a few blocks from the French Quarter, he’d love to be a short drive, or better yet, a short walk, from his bed. Sadly, that’s not possible because Francis doesn’t make quite enough to live on his own and pay market-rate rent in New Orleans. Like many who are the backbone of New Orleans’ renowned traditional culture—musicians, Mardi Gras Indians, and social aid and pleasure club members—Francis has traveled the world playing gigs, but can’t afford housing in his own hometown. Instead, after his four-hour Frenchmen Street gig, an exhausted Francis climbs in his car and drives 30 or 40 minutes across the Mississippi River bridge to get to where he lives—his parents’ house. “That puts wear and tear on you,” he says. Policymakers have debated how best to support the city’s culture in a time of rising rents and stagnant wages. If done correctly, artist housing slated to open next year in the former Andrew J. Bell Junior High School in the Treme neighborhood could provide an important model for cities looking to preserve and support traditional culture through affordable housing. “We have the opportunity to show how vibrant arts are essential to our humanity in New Orleans,” said Stephanie McKee, the artistic director of Junebug Productions, a nonprofit that will be based in one of Bell’s community spaces. As rents have risen in New Orleans and in other arts hubs like Brooklyn and the Bay Area, McKee has watched how individual artists and nonprofits like hers have scrambled for their very existence, unable to do their best work. “Art gives us life, but it can be affected by growing, gentrifying cities,” McKee said. A decade ago, Francis and Bierria could have easily landed a decently priced apartment in New Orleans. But things changed after the 2005 disaster, when the faulty federal levees collapsed after Hurricane Katrina, flooding 80 percent of the city. Before Katrina, half of the apartments in the city rented for $500 a month or less. Today, the average monthly rent is nearly double that, at $900. But musician gigs pay basically the same as they always did. Overall, wages in this low-wage town are largely static, remaining where they were in 2000. So rent eats up a larger chunk of each household’s money. Nearly one-third of New Orleans renters pay more than half of their income for housing; 56 percent pay more than one-third, one of the highest proportions in the nation. The city’s longtime artists—painters, sculptors, actors, and poets, along with the jazz musicians and Mardi Gras Indians often pictured on tourism brochures—are particularly affected by the rental crunch because their wages fluctuate depending on the scheduling of art fairs, festival seasons, and episodic events. Though most also have a day job or some steady income, few can afford the monthly payments now needed for a New Orleans apartment near the Quarter and other gig-rich areas. Some live in a house jammed with family. Others, uneasy about the levels of gun violence in the city’s only remaining low-rent sections, have moved their families to smaller towns a few hours away and drive to New Orleans only for work, sleeping on friends’ floors and couches after gigs. In response, some organizations have started to create artist-specific affordable housing in the city, something that didn’t exist before Hurricane Katrina. The most recent, and ambitious, of these projects is the $37 million development now under construction called the Bell Artspace Campus, named after its Minneapolis-based nonprofit developer, Artspace. When finished, the campus will have restored two city blocks, creating 79 apartments from a group of dilapidated stone and brick buildings that were built as a convent in 1904, and used as public schools from 1960 on. In the center, a manicured green space will provide a place for neighborhood gatherings, cigarette breaks, and general relaxation. The studio, one-, and two-bedroom “live-work” apartments in the Bell Artspace Campus are targeted to tenants making between 30 and 60 percent of the area median income, with rents ranging from $260 to $727 a month. A preference will be given to artists and to a few arts-driven nonprofits like Junebug, which will receive below-market rental space. Residential rent will vary depending on a tenant’s income bracket, thanks to government subsidies like federal low-income housing tax credits. Artspace pioneered the use of those tax credits to finance artist-specific residences in the late 1980s in Minneapolis. The Bell campus is located in the heart of the Treme neighborhood. A few decades ago, musicians routinely walked along the sidewalks of Treme carrying tubas or bass drums to gigs in the nearby French Quarter. If bandleader Benny Jones from the Treme Brass Band got a last-minute gig, he could stash his snare drum in the back of his pickup truck and simply drive around the neighborhood, grabbing his trumpeter on Marais Street, his bass drummer on Orleans, a saxophonist and tuba player on St. Philip, and a trombonist on Dumaine. Certainly, neighborhood rents had begun to rise before Katrina. 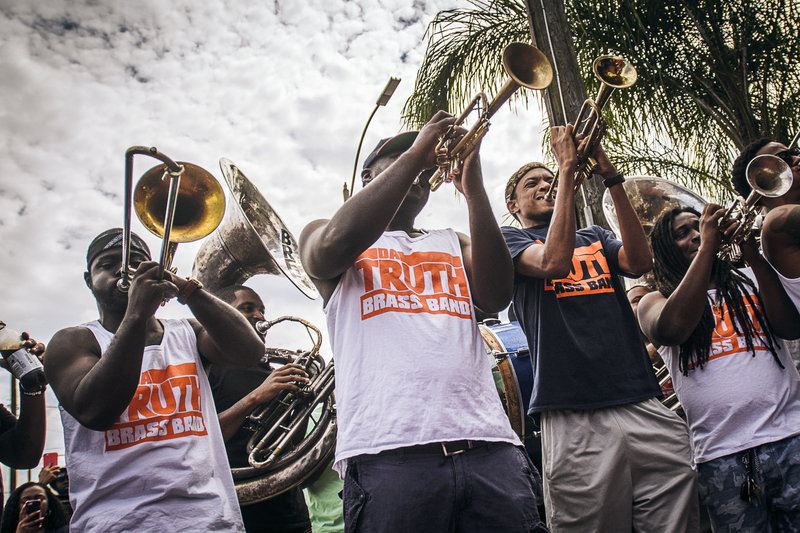 Treme became a household name thanks to David Simon’s HBO series about it, called Treme. But gentrification accelerated rapidly after Katrina, as returning residents and disaster workers scrambled to find unflooded apartments in this and other high-ground neighborhoods. By the time the HBO series aired in 2010, only a handful of musicians still lived there. Artspace’s local project manager, Joe Butler, 48, witnessed the progression first-hand. Butler, a native New Orleanian, also immediately understands why artists whose families have deep roots in the gentrified Treme want to return there. After all, he still lives on the same block where he grew up, in a home that his grandparents owned. “I lived two houses away from my mama until she died three years ago, so I get it,” Butler said. Butler has also analyzed housing data and talked with enough people in the neighborhood to understand who needs affordable housing most. “New Orleans is special because we have so many people in the informal economy as culture bearers and musicians,” Butler said. “They represent the largest sector we’re trying to serve.” Since he has successfully presided over the leasing of other Artspace buildings, he knows what works. “The key is outreach,” he said. It seems that sufficient outreach has not always happened in arts-focused tax credit housing. In a May 2016 report titled, “The Rise of White-Segregated Subsidized Housing,” University of Minnesota professor Myron Orfield charged that artist apartments he studied in Minneapolis were disproportionately white and constituted a misuse of limited housing subsidies. Because of the artist developments’ high construction costs, Orfield dubbed them POSH, for Politically Opportune Subsidized Housing. “These buildings are troubling,” Orfield writes. “They capture resources intended for the region’s most disadvantaged, lowest-income families and repurpose those resources toward the creation of greater segregation.” The developer whose work was analyzed has defended its practices and says that it is careful to abide by fair-housing laws. It’s tough to make broad, cross-country conclusions from Orfield’s analysis of only four developments, but the issues Orfield raises make his report a cautionary tale of sorts for anyone creating artist housing. He asks, for instance, why some arts developers use selection committees to talk with potential tenants and view their portfolios. When there is no formal procedure, Orfield said, steps like these have the potential to inject bias surrounding who is a “real” artist. Orfield’s report also raises questions about data. Data was scarce on low-income tax credit units until 2008, when Congress issued a mandate that the U.S. Department of Housing and Urban Development collect data on them as part of the Housing and Economic Recovery Act (HERA). HUD published its second report earlier this year using 2013 data collected from states, which administer the Low-Income Housing Tax Credits program. While HUD is making efforts to improve what it gets from states, right now the data is sporadic and sketchy. Some states skip entire categories or report them differently from others. Minnesota, for instance, only reports the race of heads of households, while others request racial makeup for all household members. Tenants also don’t have to respond to the question about race, leading to potentially misleading conclusions about diversity. For example, Artspace’s PS109 development, a five-story, neo-Gothic former school building in East Harlem, got an 89 percent response rate to the race question. Of those respondents, 88 percent were artists of color. Yet at Mt. Rainier Artists Lofts in Maryland, only 12 of 37 households responded. From those reported numbers alone, Rainier appears to be 100 percent white. However, property manager Joe Butler, who also is the local property manager at the Bell Artspace Campus, says he has no doubt that 80 percent of the heads of households are African American. Given data holes like these, Orfield agreed that falling back on observation is reasonable. “If you look and the buildings are diverse, you don’t have as much to be [worried] about,” he said. If you look at visual artist and sculptor Giannina Gutierrez’s home you wouldn’t be worried. Gutierrez, 33, landed one of 89 spots in a lottery for PS109, redone by Artspace in cooperation with El Barrio’s Operation Fightback, a community development organization. Roughly 55,000 people applied for an apartment in the building. The city required that 50 percent of PS109 apartments be awarded to residents of East Harlem, which helped Gutierrez, who had been active in the neighborhood for about 10 years. The building’s residents are diverse—“a rainbow of people”—she says. And her neighbors are often seasoned artists with roots in East Harlem, which “gives context to the neighborhood,” allowing newcomers and a younger generation to understand the history of the ground they stand on. “We’re starting to establish ourselves as a neighborhood art institution,” Gutierrez says. Butler’s convincing of Junebug to be part of the development was one step in giving confidence to observers that Bell Artspace’s tenants are likely to reflect the historic Treme neighborhood. Junebug is built around the idea that art can achieve social change—it was founded by playwright, director, actor, and activist John O’Neal, who co-founded, in 1963, the Free Southern Theater, the cultural and educational arm of the civil rights movement. Butler also reached out to Providence Community Housing, which created another affordable-housing success within Treme. HUD demolished and re-did four of the city’s biggest public-housing complexes in the wake of Katrina, and Providence oversaw the rebuilding of the one located in Treme—Faubourg Lafitte. It ensured that original residents returned at rates five to six times as high as in the other developments. Other cooperative ventures also emphasize the community focus that Butler has tried to maintain. The New Orleans Master Crafts Guild will train a new generation of artisans to restore the façade of Bell’s impressive Gothic chapel. The hope is to create a new local workforce well-versed in the art of brick masonry, metal, and plaster, skills routinely imported from elsewhere to restore New Orleans’ historic architecture. One obstacle to getting low-income artists into affordable housing is that most traditional artists don’t keep standard financial files, as Habitat for Humanity discovered when it launched the Musicians’ Village, the first large-scale arts housing in New Orleans, built on the site of a former school in the upper 9th Ward. In late 2005, not long after Katrina, musicians Harry Connick Jr. and Branford Marsalis asked Habitat to establish several dozen houses that musicians could qualify for through sweat equity along with a 20-year, interest-free loan. But, early on, Habitat found fewer musicians qualified than it had hoped. It hadn’t predicted the level of bad credit and outstanding debt or the general lack of documentation. So Habitat reworked its process, using specially earmarked money from donors to help some musicians pay off small outstanding debts and working with many others to find alternative ways of proving income for the Habitat-underwritten loans. Though it took some heavy lifting to create, the Village is now bustling with musicians. The delinquency rate on loans there has been very low, Oestricher said. The next artist lofts in the city were also located in the upper 9th Ward, but a few dozen blocks closer to the Mississippi River. Developer HRI Properties built 67 affordable rental apartments in a rehabilitated garment factory in two phases known as Bywater Art Lofts I and II. HRI has since completed another arts complex, Blue Plate Artist Lofts, in the Broadmoor neighborhood. The tenant data maintained by the state of Louisiana is minimal for Bywater I, which was finished just as HERA began requiring data. Half of its tenants didn’t provide race information and the other half listed their ethnicity as white, which doesn’t match what neighbors and tenants see there every day. For the later two developments, the data is more complete: Bywater II tenants are 55 percent white, 37 percent African American, and Blue Plate tenants are 52 percent African American, 40 percent white, much closer to the overall city demographic, which is nearly 59 percent African American. Learning from their artist-housing predecessors, Butler and McKee are going to start convening meetings for potential tenants by early 2017, even though the property won’t start taking applications until the fall, to encourage them to get their paperwork in order. Across New Orleans, the Bell campus is particularly remembered for its Marching Crusaders band, led for 32 years by legendary band director Donald Richardson. A scan of the city’s leading jazz players reveals a long list of musicians who came up under Richardson, including many members of the Grammy Award-winning Rebirth Brass Band. For Marc Francis, that is meaningful. “Because of Bell’s history of music, it would be a special place for us,” said Francis, who also likes knowing that the school will have both a practice space and a green space where he can blow his horn on a sunny afternoon. “I would like to live somewhere that is appreciative of me being an artist,” he said. I live in the Treme. About a block and a half outside the Quarter. Fourteen AirBNB’s on my block.